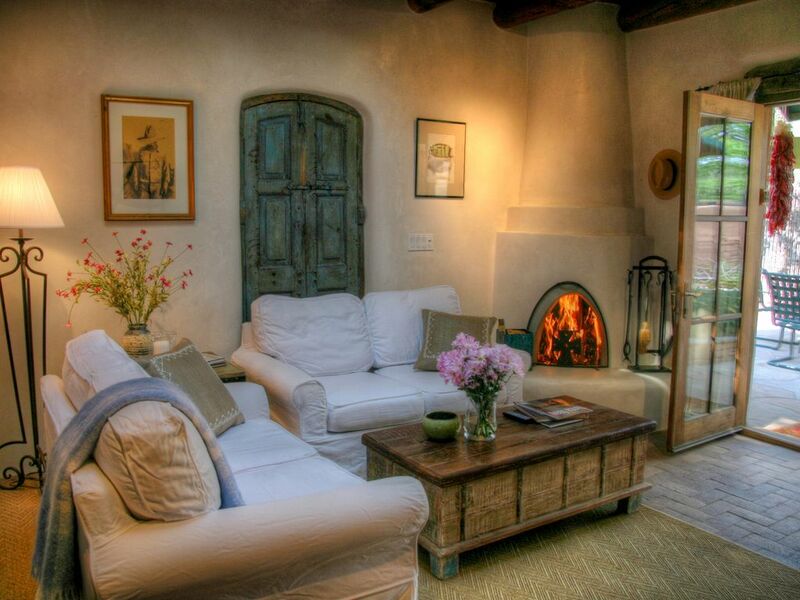 Tucked away on a historic street, Casa de la Boda (the Wedding House) offers the perfect east-side location for your Santa Fe adventure. Located just two blocks from Canyon Road and short stroll to the Santa Fe Plaza this lovingly remodeled two-bedroom adobe home blends the charm of it’s historic roots with the modern conveniences of a comfortable lifestyle. A rambling flagstone patio with kiva fireplace and hot tub greet you as you enter the property. Inside, each bedroom offers an en-suite bath and private fireplace and W Hotel-brand pillow top mattresses (1 King, 1 Queen) ensure a good night’s sleep. French doors from both the living and dining areas open to the patio to create a seamless connection between indoor and outdoor living. The home is bathed in light from skylights and the bedrooms and living areas are kept comfortable by a central evaporative cooling unit. Radiant heated floors greet bare feet each morning in the winter. Just outside it’s courtyard walls are two, private parking spaces. As former residents of Denver we loved coming to Santa Fe on a regular basis. Now that we're locals we wanted to create a place that's perfect for a small family or two couples to come and soak up the local arts and culture. Now, when the property isn't being enjoyed by guests, we'll spend a couple days there and walk to all the things that attracted us to Santa Fe in the first place. We purchased the property before it even went on the market. It just took one look at the courtyard area and the quallity of the home (remodeled by a Denver architect about 10 years ago) to see the potential as the perfect getaway. Close-in, east-side location just two blocks from Canyon Road's 100+ art galleries and four blocks from downtown. Large, flagstone patio surrounded by courtyard walls. Incudes Kiva fireplace and Hot Tub. Area courses include: Towa, Marty Sanchez, Cochiti, Santa Fe Country Club and Black Mesa. Great home! Thank you for sharing. Loved staying at Casa de la Boda! Such a cute home. My husband and I stayed 5 nights in early March. We enjoyed the hot tub and fireplaces immensely. Plenty of firewood provided. Thank you! Loved the heated floors, however we didn't discover those until the last day when we turned the heater on for a bit. The kitchen was very well supplied, with the exception of a potato peeler. My only suggestion might be to switch the TV arrangement. Huge TV in the master bedroom and tiny TV in the living room. Had it not rained so much while we were there we probably wouldnt have been inside to notice as much and would have been enjoying the cute patio area instead. If we come back to Santa Fe again we would definitely stay here again. We love this home. It was our second time staying there. It is cozy, comfortable, great kitchen, wonderful patio and great location! Casa de la Boda was perfect for my husband and me. The location provides easy walking access to Canyon Road, the plaza, museums, etc. Great privacy and quiet behind the walled courtyard while being in a lovely residential neighborhood. We were in town when it was snowing so the hot tub, the kiva fireplaces and the radiant heat in the floors were a plus - very cozy and comfortable. Rick was easy to deal with and responsive to our needs. The casita was very clean and cozy. We especially enjoyed the hot tub and the proximity to town. A few things you should know... the toilet in the master occasionally runs (meaning the tank doesn't fill so you have to lift the lid and fiddle with the parts to get it to fill), there are three burnt out track light bulbs -- master bath, master closet and kitchen, and we saw a mouse in the kitchen one night. We did not, however, encounter any mouse droppings. Casa de Boda was a perfect Christmas experience. The location allowed us to easily walk to Canyon Road, Downtown , Kakawa Chocolate and Subscription coffee shop. It was packed with any amenity you might need (other than food). We highly recommend it, thanks Rick! From Casa de la Boda you are close enough to the plaza to hear the church bells of St. Francis Cathedral, walk to town or make the two block stroll to Canyon Road's 100+ galleries, shops and dining. And, just a block away, is Santa Fe's infamous Downtown Subscription coffee shop and the best Cafe Mocha and magazine selection in town. Major festivals and activities include: Santa Fe Opera season, Santa Fe Folk Art Market and the world famous Santa Fe Indian Market.